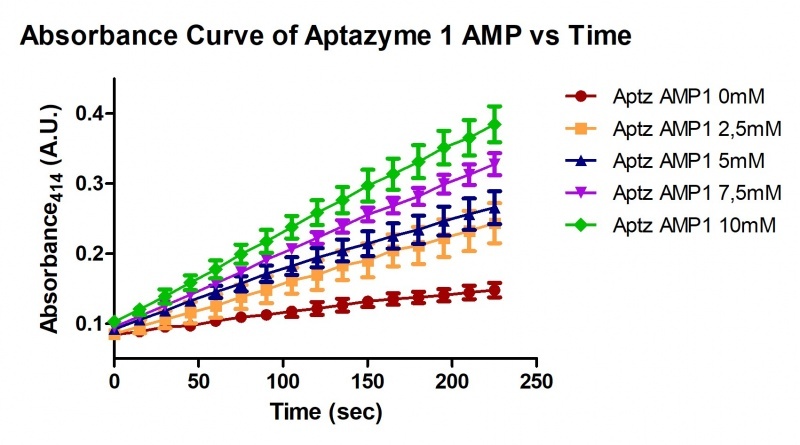 It is observed that in those wells with aptazyme 1 of AMP (figure 1), there is a dependency of the dose of AMP because the curves for each concentration of AMP present a tendency of overlap in an absorbance vs time graph. These results support the hypothesis that aptazyme is dose-dependent and that the catalytic region (DNAzyme) is sequestered by the linker sequence when there is no ligand presence, being exposed once the AMP is recognized by its aptamer. Respecting the DNAzyme wells, it can be observed that the curves do not overlap according to the AMP concentration (figure 2), so the sequence is not dose-dependent. This allows corroborating the specificity of aptazyme for AMP and the low specificity of DNAzyme for AMP (it does not have the aptamer sequence). The AMP aptamer wells present curves with rather lower absorbance values than those of DNAzyme and AMP 1 aptazyme (data not shown). Figure 2. Absorbance vs Time Curve Dose-Dependence of DNAzyme. It is demonstrated that DNAzyme possesses an activity independent of the STX concentration (figure 3). This means that indeed DNAzyme does not need the aptamer ligand for its activity. The most active aptazymes are Aptazyme AMP 1 and Aptazyme STX 1 (figure 4). It is deeply interesting that the APTz AMP 1 is the one with the most activity, above the j_4 (the one we design). This could be explained because the nitrogenous base of the AMP that forms part of its molecular structure and that of STX is in both cases a purine (adenine). This is fundamental, since by accident we could have found a new way of measuring STX, delivering a signal that is very wide and visible to the naked eye; This could mean a problem because in environmental samples you can find other ligands that are recognized by the aptamer, some like AMP or other toxins. It is observed that the activity of APTz AMP 1 and APTz STX 1 are affected by the concentration of STX, due to the greater absorbance that is generated in a 0.45 uM concentration of STX. It is striking that the absorbance of J_4 is not affected. The STX control shows that all the aptazymes functioned thanks to the presence of STX. 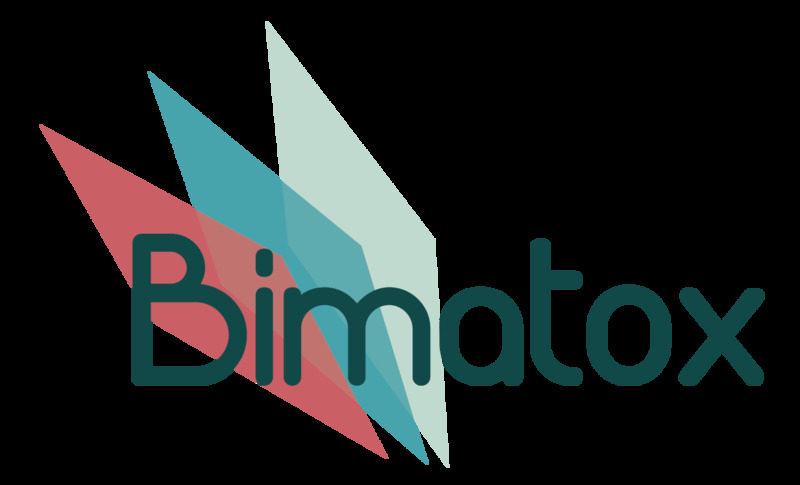 The aptamer controls work as expected, they only emit noise and insignificant absorbances. Figure 3. Absorbance vs Time Curve STX-AMP aptazymes assay without STX in HEPES. Figure 4. Absorbance vs Time Curve STX-AMP aptazymes assay with STX in HEPES. In comparison with the results obtained in the previous experiment with the HEPES buffer, the absorbance values of the different aptazyme sequences were lower in the pBS-T buffer, which according to the literature increased the affinity of the saxitoxin aptamer with it. Also when it was not placed in the saxitoxin solutions, the activities of the different sequences showed a marked increase in the error, which suggests that the sequences adopt conformations in a random manner (figure 5). Secondly, the absorbance values of the saxitoxin aptazyme J_4 were increased (figure 6), which raises evidence to think that the buffer plays an extremely vital role in the recognition of the ligand by the aptamer and also in providing ideal conditions for the DNAzyme reacts. Finally, when the tests were done with AMP, the only sequence that showed remarkable activity was the AMP aptazyme, showing that the sequences of aptazymes for saxitoxin are specific to recognize this molecule (figure 7). Figure 5. Absorbance vs Time Curve STX-AMP aptazymes assay without STX in PBST. Figure 6. Absorbance vs Time Curve STX-AMP aptazymes assay with STX in PBST. Figure 7. Absorbance vs Time Curve STX-AMP aptazymes assay with AMP 5mM in HEPES. The only aptazyme thrown by JAWS that presented a remarkable activity with respect to the others was the J_1 (figure 8). In addition, the J_1 sequence showed a dependence on the concentration of saxitoxin, unlike the other sequences (figure 9 and 10). The difference between the curves was not remarkable as it was for the experiment where different doses of AMP were used. In the case of the AMP experiment, the concentrations of AMP used varied in the order of millimolar, which serves as evidence to think that perhaps the aptazyme of saxitoxin J_1 may have a more remarkable dosis-dependece activity with a bigger concentration of the toxin. Figure 8. 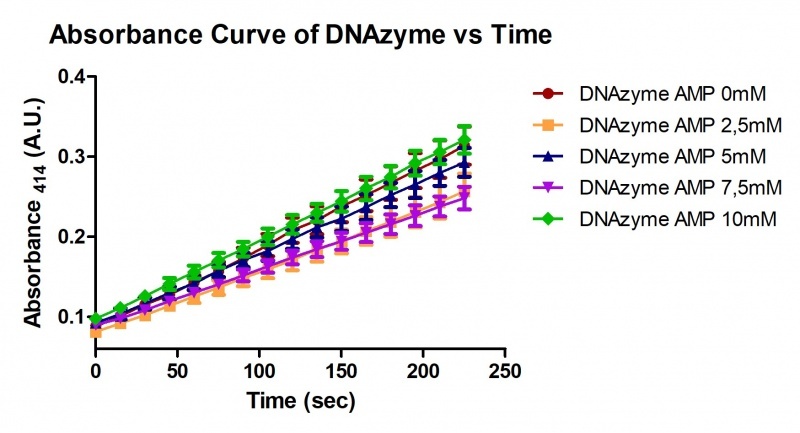 Absorbance vs Time Curve STX J_1 aptazymes assay with different concentrations of saxitoxin. Figure 9. Absorbance vs Time Curve STX J_2 aptazymes assay with different concentrations of saxitoxin. Figure 10. Absorbance vs Time Curve STX J_3 aptazymes assay with different concentrations of saxitoxin.